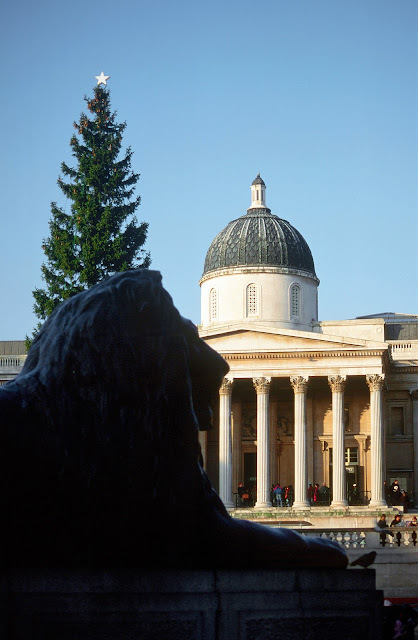 Christmas decorations in London generally don't match NYC and the tree in front of the National Gallery in Trafalgar square usually looks very lonely. In addition, in the years following the mid-nineties there were some unpleasant events on new years eve which prompted the authorities to close off the square in the run up to the end of the year. So the square can be a desolate place in early winter. On a more positive note, traffic has been diverted around the square since this picture was taken so cars and buses no longer pass between the museum and the monument and so tourists don't risk death in their rush to feed the pigeons. Why anyone would want to do that in the first place is beyond me.